An adventurous trek that takes in some of Torres del Paine's most famous sights, with a route that weaves across the W Trek on rarely-travelled paths to which few are ever permitted access and gives you a chance to actually reach out and touch the normally distant Los Cuernos. Our guide will meet you at the Punta Arenas Airpot. Transfer to Puerto Natales, a three-hour drive through the Patagonian pampa before a meeting to discuss the trip programme. In the morning we will take a two-hour transfer through the Patagonian Pampa into Torres del Paine National Park. Once we arrive we will trek to the Ascencio Valley where we will be able to see the Ascensio River running wildly past refugio Chileno. After a stop here we will continue through a forest of the native Lenga (Beech) trees until reaching the glacial moraine. From here it's a 1-hour trek to the top where the three spectacular pink granite towers that made the park famous appear from nowhere, with the glacial lake glistening below. After spending some time to take in the view we will head back to our refugio for dinner. The first of the forgotten valleys we will visit is the vast Silencio Valley, via an almost unknown trail that climbs up to the source of the Ascencio River through dense rainforest. From here we will be able to admire the mythical granite spires of Escudo (the Shield), Fortaleza (the Fortress), and the Towers of Paine. Afterwards, we will return to our lodge for dinner. This morning we will commence our hike back towards Hosteria Las Torres, and then West along Lago Nordenskjold, which is named after the Swedish geologist whose studies formed an important contribution to world glacial geology. 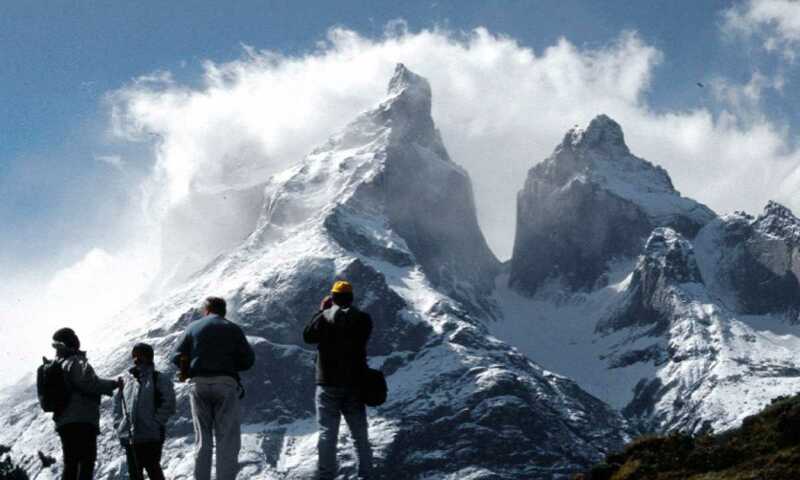 We will walk below the hanging glaciers of Mount Almirante Nieto, finally arriving at the base of Los Cuernos. We will then head to our refugio/ camp for dinner. 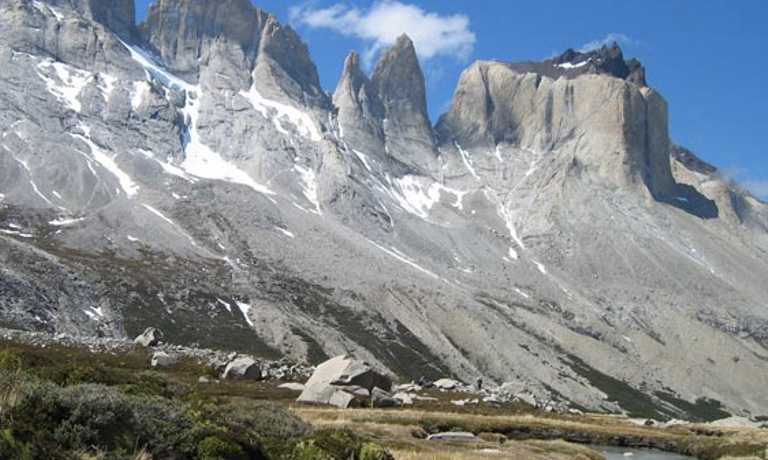 The trail towards the Bader Valley begins with a 20-minute trek from Refugio Los Cuernos, followed by a 45-minute uphill hike towards a campsite that is set up for climbers. We'll then enter the Bader Valley, and cross the Bader River, taking in spectacular views of the tall imposing granite walls of the Cuerno Principal, Este & Norte (the principal, East & North Horns), and the Espada, Hoja, Mascara & Almirante Nieto peaks. After trekking 2 more hours we will arrive at the slabs of the East Horn, which, weather permitting, we can actually touch. After taking in the spectacular views of the valley below, we will head to our refugio for dinner. This valley is arguably the most beautiful in the park and one of the most unique in the world, surrounded by hanging glaciers (from which you can frequently see & hear ice calving), and an amphitheatre of granite walls and spires. The views just get better and better the further you trek into the valley! On the return journey, you will notice the extraordinary turquoise colour of Lake Pehoe (hidden lake in the Tehuelche Indian language). Once we return to the lodge we can enjoy a Pisco Sour in the bar overlooking Paine Grande & Los Cuernos. Today we will trek along the enchanting Lake Grey, with magnificent views of Glacier Grey and floating icebergs. We will visit the glacier lookout point and the lakeshore for up-close views of vibrant, blue icebergs (Paine is a Tehuelche Indian word for blue). At lunchtime, we will take a two-hour boat trip, surrounded by ice bergs on the magical Grey Lake, and right up to the front of the Grey Glacier, whilst you stand on deck sipping your Pisco Sour served with glacial ice! This magical valley, rarely visited by tourists, contains some of the oldest rocks in the area, as well as ancient forests. You may even be lucky to spot one of the native Huemul that inhabit the area. On our return, our private van will be waiting to return us to Puerto Natales for a farewell dinner at our lodge. Taking the Forgotten Valleys tour allowed us to get away from the crowds, this was much appreciated as the park was very busy. This trip can run as a group trip, with prices starting from $3,495 per person for a complete group. If you are looking to join a group or you are a solo traveller we will help to form likeminded groups of travellers. Please let us know your travel plans.